10/10 Great techniques that really work. I just this spring had the privilege to become one of Grandmaster John's students both in Taekwando and Kettlebells. He has incorporated the techniques in his book into his classes. As a soldier it is vital that I remain both strong and agile. I came into his teachings from a background of heavy lifting with little emphasis on mobility. I have gained inches of flexibility and retained my strength. Now I have a guide I can take anywhere I go. This book gives a detailed guide on how to revitalize your body and move with power and grace. It is easy to follow and as I can personally attest, effective. I look forward to accomplishing the splits as a 30 year old. There are books that you read and put in your library and there are books that you read and keep referencing over and over... This is one of those books! I've had the opportunity to get to know Jon and attend his Flexible Steel Workshop, the man is brilliant! This book provides a nice progression and guide to improving your flexibility and helping you move better. From my personal experience of applying his knowledge to my own training, I can tell you a lot of my daily aches, pains and movement issues have disappeared. This resource is simply a MUST HAVE! When Jon Engum presented this material in a workshop, I had two questions: 1) Can I get my kicks back and 2) would I be able to see the return of a split. The answer was yes and yes on both counts. The drills presented in this book will get your flexibility goals in an insanely fast period of time. With my background in Chiropractic, I have seen many different flexibility modalities and Jon has taken these principles and made them accessible for everyone. If you work on the program as laid out you will improve. PERIOD. And even better...Master Engum isn't just peddling theory..He is a living breathing example that this system works and he also has a growing list of students to prove it. Don't take my word for it however. Practice the drills and convince yourselves that Flexible Steel is a gold mine for your flexibility training. 9/10 This is a keeper. OK. I just read "Flexible Steel" by Jon Engum. I've been around martial arts for 40 years, but I wasn't familiar with Jon. He's paid his dues however. He's a high rank in TKD and several other Korean martial arts. If anyone should know about flexibility, it would be Korean high kickers, right? Well John has been there, done that and got the T-shirt. He admitted separating the concept of "practicing martial arts" vs treating yourself as an athlete. Then he began applying the methodology around "Relax Into Stretch" and "Super Joints" to break out of his 'morning tinman' feeling. Well it worked. Not only did it work, but Jon let his crazy, creative, mind wander, conspire and re-wire his whole method of turning the human body into flexible steel. He took the tools and organized some training patterns. These are the basics with details. Usually they are lost in translation, forgotten or ignored. Jon however covers them thoroughly and in a calm conversational writing style. He offers more than one way to approach things and highlights details while avoiding unnecessary complexity. -Well organized and easy to follow. You want to get down on the floor and do what Jon does. - It's a complete system of opening the hips for those who are inflexible as well as those who rely on flexibility in the athletic arena. -It could have use more photos. This seems to be very critical, but the more the merrier when it comes to illustrating exercise. - Jon could have devoted time to the shoulders as well as the hips. He covers mobility for all parts however. - The price point for an E Book is a bit high. This is around 80 pages after subtracting ad space. By comparison, Bret Contreras' Glute E Book is 675 pages and similarly priced. I feel this type of feedback is valuable for Dragondoor. - Your hips are tight and you are feeling old. - You are in martial arts, rock climbing or parkour. - You are overwhelmed with too much data and want a solid routine instead of a handful of useless drills. I look forward to more material from Jon Engum. He's got a bright future. Lots of people have asked me about advanced flexibility training since they can do this or that & are looking for the next step in their training. If you're looking for an easy-to-follow format that's going to get you more mobile in a manner that's still going to give you quick-twitch strength, I strongly recommend that you peep this work by my colleague, Jon Engum. Engum is a Master RKC strength training professional & a legitimate 7th degree Taekwondo black belt who can COMPLETELY walk the talk. This book gives you the fast-track insights into the training methods that he's used to turn the below-average Joe into flexible steel. When it comes to flexibility Jon Engum knows his stuff. I had the opportunity to learn these techniques directly at one of his flexibility workshops where the results were literally instant and dramatic. For that reason I bought this book the moment I learned about it and it was exactly what I was hoping for. On the surface this book may seem to be about techniques and methods that can be found elsewhere, but the reader that digs further and has the courage to do more than skim and actually follow the instructions as written WILL be rewarded. As Jon states in the introduction, he is not taking credit for these ideas is he is simply showing you how to combine and apply them… and honestly, that’s where most people fail and it's exactly what I needed. What I love about Flexible Steel is the author takes picks up where other books leave off and simply says “do this”. Jon Engum’s Flexibile Steel is the most direct approach to effective flexibility I’ve found anywhere. It’s a concise step-by-step manual that eliminates all the guess work. A structured approach to stretching that tells the reader exactly what stretches to do, in what order, and for exactly how many reps and sets. Within seconds of getting the book I was able to skim the table of contents, open up to the “Frog Stretch” routine, follow along… and start seeing the results. Thanks to doing this routine twice a week my hips have never felt better. 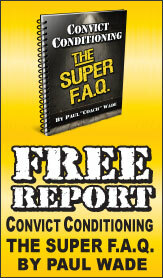 If you want a no-nonsense instruction manual without fluff for instant and dramatic gains in flexibility, this is it. Your body will thank you, your competition will respect you and your clients will love you. 10/10 A must have book! Great information on how to balance strength and flexibility to become a better athlete and trainer. A must have book to minimize injuries! Don't wait any longer and get your copy! Thank you for writing a book strategically designed to help me get my flexibility back in the safest manner possible. This book is easy to read, easy to follow and clearly written by someone who "knows his stuff." This is a great book for the casual everyday athlete as well as the professionals out there who want to increase their flexibililty and train more effectively. Get it--you'll be happy you did! [ ] an owner of a human body? If you answered yes to any of the above, then you need this book. In a very short list of books that should serve as EVERYBODY'S owner's manual to maintaining a healthy, supple body, this book is an indispensable inclusion. And this book seriously has everything. Do you know how to take your hip flexibility from chump to champ? Do you know how to pack on serious rotational ability in mere minutes? How do you unlock your knotted-up shoulders? And most importantly, do you know the three principles of flexibility and how to apply them to every stretch in the book to take it from mere exercise to serious power tool? This book does more than teach. It enlightens. Better still is how quick and effective it is for anyone of any age and ability level. I have seen Jon in person return high-mileage bodies to the buoyant flexibility of their youth in a matter of minutes. The powerful information in this book must be experienced to be believed. But the best part about Flexible Steel is the programming tips. All sorts of questions I had about how much/often my clients and I should stretch were clarified and programmed simply, easily, and effectively. These are considerations many overlook in attempting to improve their flexibility, but their proper programming can make the difference between mediocre and extraordinary results. This book has it all. It's become the go-to guide for flexibility for me, my clients, my family, and my friends. Buy this book. You owe it to yourself, and your body will thank you. 10/10 A Must Have Book In Your Collection! I have had the pleasure for the past few years to be participating in Master Engum's kettlebell class. In that time he has proven time and time again that he truly is one of the top experts in not only kettlebells and martial arts but in flexibility and stretching. I was very excited to learn that Jon was writing his flexible steel book. When it was finally published, it was better than I expected. Flexible Steel is the ultimate how to manual to increase your flexibility and strength. Great book! Great Instructor! Great Guy! Buy Flexible Steel today. I have been taking Jon's noon Kettlebell class for several years now. His class has become a regular part of my life. I recently came to realize what a tremendous asset Jon is to our lives and how very lucky we are to be able to participate in his direct training. I have read his book and have been faithfully doing the "Escape your Fighting Stance" 3 times per week for the last few months. I have pegged this series of exerices my "feel good" workout. It is a great way to start my day. I would recomment this book to everyone as a "must read". I love the examples in the book. Jon does a great job of demonstrating all the different exercises and boy do they work!! If you want strength and flexibility this book and his classes are a MUST!! Excellent Book! Provides me with a GREAT source to fall back on to keep me flexible! As a hockey goalie I am always struggling to stay flexible and limber. This book provides a quick source to review to keep me on track! Jon is an excellent instructor and I have enjoyed his kettlebell classes for several years. As a 53 year old woman flexibility is key. Thanks to this book it is not only possible but probable...if you read and follow the well explained moves in the book! I have been in Master Jon's kettlebell class for 3 years, so many of the stretches in this book are very familiar to me. Still, I recommend purchase of this handbook as it includes the small details that make your stretches much more effective and the advanced nuances to augment the primary moves. As a Doctor of Chiropractic and a Certified Applied Kinesiologist, I find this book to be a fantastic reference for teaching my patients to increase their flexibility and decrease their pain. THANKS JON! This book is very user friendly. Great pictures to help readers understand the different exercises and stretching moves. I recommend for everyone! 10/10 "From rusted tion tio Flexible Steel"
"From rusted tin to Flexible Steel"
Before I met John I was slowly plodding towards my pain filled golden years. Shoulders hunched, achy joints, sore muscles, blah blah ow! Through thoughtful training of the techniques in this book, John has encouraged and taught me to do things physically that my brain thought impossible. I joke that I haven't been this flexible since...well, the birth canal. Kettlebells and flexibility training have changed my life. 10/10 Great for EVERYDAY mobility and stretching! At first glance, this book might seem just for hard-core athletes. I am fortunate to have Jon as my kettlebell instructor. We use the moves in this book to start & finish every workout. I also start out my non-workout days with the mobility drills before I sit down to work at my sewing machine. Those same drills are great for a mid-afternoon break to loosen up my neck & shoulders for more sewing or other tasks. The exercises are easy to follow with good explanations & photos.If you want better flexibility in your workout, athletic endeavors or everyday life, this book is for you! 10/10 FLEXIBLE STEEL IS AWESOME. I'm 58. I have been in Jon's Kettle Bell Classes for 3 years. His knowledge and ability to present to the student is good. The book is a good, quick rescource for stretching. My wife has never been in his class and she loves the book for a good reference. The Kettle Bell work out and the Flexible Steel are superior to other exercise progams I have done and it keeps me motivated to do it. To free your body of pain you must first untie the knots tension and time has tightened up in your body. I learned this life lesson directly from Jon Engum, Master RKC, CK-FMS. I have been a student of Mr. Engum for 3 years. The kind, strong dedication he devotes to his students is written on the pages of his book, Flexible Steele. Regardless of your current ability, these mobility drills will improve your day, both physically and mentally. Do them one page at a time, one day at a time and you will start to gain freedom from life's knots which will translate into energy. Before practicing these mobility drills I could not stand up from a seated position without unlocking my knees and using my arms. I could not easily walk up stairs, turn my head to look over my shoulder, touch my toes, squat ... balance on one foot! These may seem like simple movements ... till you can't do them. Flexible Steele is the first step to improving your life, I'm living proof. Taking a kettlebell on vacation just isn't an option, but this sleek book will be travelling with me to keep my body limber while relaxing. This is a great start to any morning routine, as it gets the blood flowing and can be done in a small area. I just purchased my copy of flexible steel written by the infamous Jon Engum. I have a martial arts background. However, because of injuries and a surgery I have to completely regain all of my mobility and flexibility. I am fortunate to have this book, and to personally know the author. It will be my guide to recovery. Jon Engum is very dedicated and has proven the techniques over and over again. This is the only manual I need to own to recover and get back doing the things I love and need to do. I also love the easy read. This is a must own book. Do yourself a favor and get your copy. YOU WONT BE SORRY. for $26 you can get stretching scientifically 198 pages (twice as much) has the research and the methods much better and the guy actually does front splits and not just the jazz split. The biggest benefit of this book is its simplicity. It is very direct, skips a great deal of the scientific/theoretical stuff and just tells you what to do. I first encountered Engum on the Breaking Muscle site and I've been using some of his workouts from there as a warm up. Proof's in the pudding. I've wanted to get my bench up but my shoulders are very touchy. I attribute my ability to work the bench at higher frequency (low volume) with no shoulder issues to Engum's instructions about the arm bar (contained in this book). On the other hand, Dragon Door has spoiled me. I'm used to Pavel's books which tend to be decently thick and loaded with content and great thorough technical explanations of each move (but less comprehensive "do this" workout programs and more "choose your own adventure" programs). I guess I wasn't paying close attention but this is a very thin book for $25. Engum presents his material as if it is a practical appendix to Pavel's Relax into Stretch and Superjoints. Despite this, there are large sections in this thin book that are pretty unusable for me (ie. going to beach and using the water and sand to help your stretching - I live in urban central PA. Its cold and we don't have a lot of pools an beaches.). This book is also focused on the splits and less attentive to knees and other problem joints. I suppose the idea is that if you fix the hips, everything else will follow, but I'm not 100% convinced. So, if you want to get the split and/or you want a quick resource for a daily mobility program and are willing to pay $25 for short and sweet, then get this. It will help you. Personally, I was expecting a bit more for the price. don't waste your money on this book!!!!!!!!! As an older adult and having been desk bound for 30 years with little exercise, I find this very hellpful. Adjusting it for my age and physical condition, I am progressing and very well pleased. The range of motion exercises are especially helpful. Jon Engum has given you everything you need to know about becoming more flexible, including recommendations to read some of the same sources he uses - how great is that? Mr. Engum walks the walk as well as talks the talk, and his experience as an instructor shines through in this book. I recommend it very highly. 10/10 Jon is a good teacher and very sincere. A good book and a quick read. I love the RKC approach to strength and flexibility. Jon talks about the 3 S's and adds a little more. I have many years of training in various Martial Arts and enjoyed this book. If you need to put a stretch routine together, this book will help. I have worked with Jon Engum MRKC in the past. Every time his information has allowed me to make incredible changes in my mobility and flexibilty. However with any workshop, we do not always retain every piece we have learned. Now Jon has put out an awesome resource that has his system and details all of the little things! What makes it timely is that I have had some hip mobility issues that have precluded me from effectively training for RKC2. Before getting Flexible Steel, I was actually going to not attend and lose my RKC. The Frog has helped me develop enough flexibility and mobility that I am good to go. I have only been really drilling down the program for about 2 weeks and the change is incredible. If you've watched the youtube video of the frog stretch, which is excellent BTW, and have seen other glimpses of the book then you have seen 95% of the E-book. Not nearly enough content to justify the price and for the money just having written descriptions of the stretches is ridiculas. I had to google them to figure out what the author was talking about. Also I do BJJ and have tight shoulders and this e-book had nothing to address serious shoulder mobility. Not all martial artists are focused on kicking over their own heads. I think this e-book would have made for an excellent magazine article but that's it. By Steven Gully / Bronx, NY, U.S. I'm 39 Years old now and I engage in physical activities that would have been to much for me as a younger man. This has helped me to stretch beyond what I thought was possible. I'm a fan of Dragon Door Publications for life. Jon Engum delivers the goods masterfully in this book. He takes the information and principles of Pavel's Relax into Stretch and shows you how to put them together into specific sessions in order to reach your goals. Regardless of your starting point, there is information in here that can be utilized TODAY to help move you in the direction of becoming dangerously flexible. I give Flexible Steel my highest recommendation. By Steven Coe / Tempe, U.S.A. Unfortunately I've found Flexible Steel to be a little disappointing. Many of the ideas and stretches in the book are found in Pavel's "Relax into Stretch" and "Super Joints." Granted, the author does make note of this in the book, but it would have been useful to know this prior to making the purchase. Flexible Steel does not significantly add to the movements in Relax into Stretch or Super Joints, at least not enough to justify the price. If you are not familiar with Pavel's books, then Flexible Steel might be helpful for you. If you already have the previously mentioned books don't bother. 5/10 Disappointment. Nothin' I have read elsewhere. By Tod Robinson / Arlington, U.S. Extremely limited in scope to doing the splits. If that's your definition of flexibility, baby, this is the ebook for you, I guess. Except you've probably seen the same info already, too. Mostly a rehash of Mr. Tsatsouline's writings with dashes of other people's work. Jon Engum wrote a great book, called "Flexible Steel." Very good and to the point, certainly, but what I liked about it was Jon took this "whole thing" of flexibility and mobility and turned it into a "Do This" program. I am a big fan of Jon, of course, but I like what he focuses on (both in this and in life), too. The day Jon's book was released, I bought it. I know Jon for years, and I love his logical step by step progressions, whatever he is teaching. This book is just another proof, how great of a teacher Jon is. Great book, love it. To truley maximise the potential of this resource it needs to be combined with Pavels Relax into stretch. You need both really, thats the only negative, if you dont wont get best results. However many of the techniques in this resource will help take your flexibilility and mobility to the next level. I am literally a few inchs of a front split now thanks to putting some of these techniques into practice. Great stuff! The best stretching techniques that work great because they make you feel amazing. Great material! Some I had heard before some was new. It's a great intro to a lot of Pavel's stuff. Great starting point!